Ethereal beats and enticing electronica is the order of the day on the new EP from D R O H N E set for release on Tim Burgess’ label O Genesis, Getintothis’ Patrick Clarke digs inside Parasite. 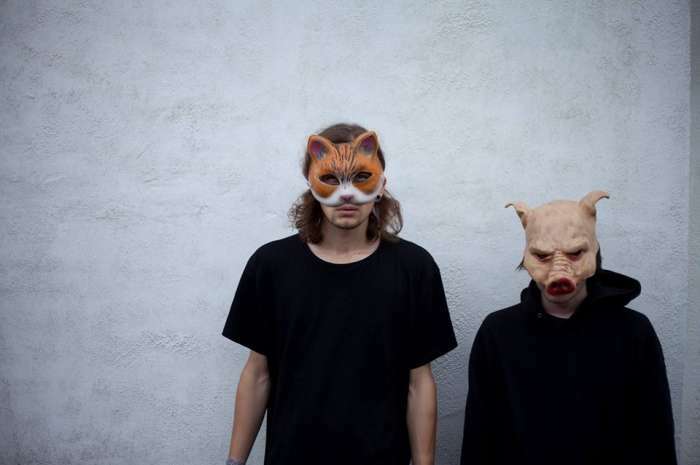 Enigmatic duo D R O H N E are fast making a name for themselves. Since being championed on these pages last year they’ve supported Factory Floor on their live debut, played Sound City and featured on the national airwaves. Most recently they’ve been snapped up by The Charlatans‘ Tim Burgess‘ label O Genesis who will release their new EP Parasite on September 1. Though armed with quite an arsenal of texture, Parasite sees D R O H N E take a measured approach, a formula of layered restraint revealing itself across the EP’s four tracks. Ever-stacking and kerbing their abundance of auditory options, it’s a release that thrives on constant progression and a sense of give and take. On opener Sample Pictures for example, washing static and a melancholy three-note melody forms a forty second preamble, until a pumping, mid-tempo beat suddenly worms its way in. Complementing and elevating the preceding placidity ethereal vocals now glide about the strengthened backbone, until the now-lush soundscape dwindles to a segment of reverse-synth serenity. When it returns the main line is more intense than ever, both by virtue of juxtaposition and the ramping up of the general sonic swirl. The remaining tracks follow a similar formula, and share a common ethereal tone. Where they differ, however, is in the blend of texture. Paradise for example lays back on intensity, slipping into hypnotic grooves where vocals and synths are given more room in their drifting interplay, while Feral Child is more overtly minimalistic, its idyllic chimes reminiscent perhaps of Gold Panda’s quieter moments. S W A R M meanwhile is the record’s darkest moment and also its best. A slow-burner, more so than its counterparts, a brooding and descending synth line leads a sinister march that’s added potency as a prickly beat joins in, while hordes of hypnotic keys add to fuggy atmospherics and already distant vocals are over-treated to the point of eeriness. Across four tracks Parasite is an enjoyable listen, and has much to reveal on repeated plays. However, though their onus on progression across an individual track is one of D R O H N E’s key strengths, that sense does lack a little when taking the record as a singular force, each track feeling separate from the next. Across the brevity of an EP that’s something of a nit-pick though, especially on a release with so much to give, and should a full length appear you can bet it’ll be worth catching. D R O H N E play Getintothis‘ Relaunch Party in the Kazimier Garden, Seel Street, on Wednesday September 3, 7pm – for full details see here. A Christmas EVOL: feat. Queen Maud, D R O H N E, Filter Distortion, Jennifer Davies: The Magnet, Liverpool Liverpool Music Week 2014: Peaking Lights, The Cyclist, D R O H N E, WYWH: The Kazimier, Liverpool Singles Club #131 Singles Club #127 Unknown Pleasures #26 ft. False-Heads, Lives of the Obscure, My Deer Festival No. 6 reveals Super Furry Animals, Broken Social Scene and more in second wave of acts Natalie McCool reveals new album The Great Unknown ahead of UK tour Introducing: BODY.